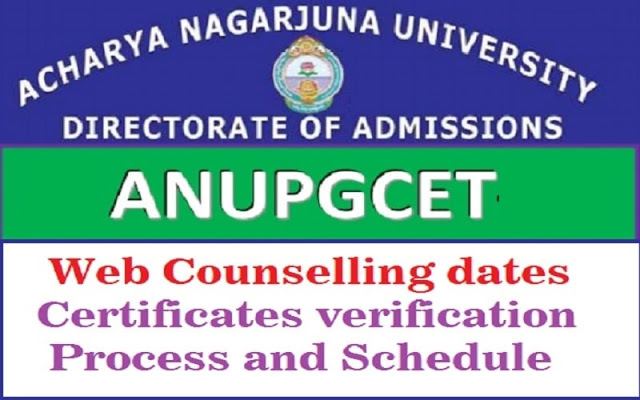 ANUPGCET 2019 1st phase Web Options-Web counselling-Seats Allotment Schedule: Web counselling Schedule, Web options dates,Seats allotment, Certificates Verification Dates, Fee Payment, ANUPGCET Admissions Counselling Schedule. Acharya Nagarjuna University had released the PGCET 2018 Notification and invited online applications from the candidates who have passed or appearing for the final year examination in the qualifying degree for admission into PG courses for the Academic Year 2018-19 offered by Acharya Nagarjuna University Campus. PG Centre, Ongole and its Affiliated Colleges through ANUPGCET-2018. ANUPGCET-2018 :: Second Phase Counselling on 05.07.2018 to 06.07.2018. 2. The students who have attended 1st phase counseling and want to slide to another College / Course can give web options during 2nd phase counseling from 5th July Afternoon to 7th July, 2018 with the same password used for the 1" phase counseling. 3. Rs.300/- as Sliding Fee has to be paid online by the candidates who already got allotment and paid fee but wish to slide across colleges / courses during various stages of ANUPGCET¬2018 counseling. Statements of Marks and Provisional Certificate / Original Degree. Study Certificates from IX standard onwards issued by the Heads of the respective institutes OR Local Candidate Certificate issued by the competent authority in the prescribed format. Integrated Community Certificate issued by the competent authority in case of SC/ ST/ BC candidates. Certificate in the prescribed form in respect of claim under special category (NCC, CAP, SPORTS and PH) where ever applicable. Two sets of attested copies of all the above certificates/documents, and additionally 3 copies each of TC, Caste 85 Income certificates.